The village of Scarrington is today well known for George Flinders' remarkable 17ft high stack of horseshoes. 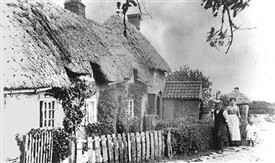 Up until the end of the last war, however, it was also home to another Nottinghamshire curiosity known as Little Lunnon - a group of about 14 ancient mud and thatch cottages which existed on the edge of the village almost as a separate community. The last traces of Little Lunnon were removed in 1945 although to many local people the memory of these charming and distinctive cottages remains sharp and clear. Descendants of the last family to live in Lunnon, the Worleys, are still to be found in the area while many others are able to point out the site where the cottages stood, grouped together in an oval just south of Scarrington off the Aslockton Road. 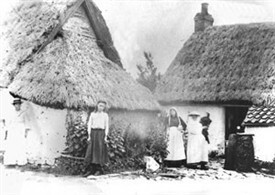 In the early years of the last century the picturesque nature of Lunnon's cottages proved something of a magnet for day trippers who saw in their quaint thatched roofs and irregular walls a remnant of rural life as it had been lived in years gone by. This romantic view, however, overlooked the background of rural poverty which had been responsible for creating the settlement. The houses were originally built as the parish poor houses for Scarrington and were inhabited by some of that village's most disadvantaged residents. Under the Elizabethan Poor Law Act of 1601 each parish in the country appointed two overseers of the poor who (among other things) were empowered to build houses for the so-called "impotent poor" using money collected from the parish poor rate. The "impotent poor" comprised those who through age, illness or infirmity were unable to work and had no means of providing themselves with a roof over their head. Poor houses were most often erected on waste or common land at the edge of a village, and this explains why those at Lunnon stood a little apart from Scarrington itself. It is not known exactly when the cottages at Lunnon were erected although at the time of their final destruction in 1945 they were considered to be 200 years old. This would date them to a period when many other known poor houses were being erected around Nottinghamshire, for example at Edwinstowe in 1740 and North Muskham in 1757. An account book of one of the poor law overseers at Scarrington dating from 1789 - 90, contains numerous entries for repairs to the "common houses" undertaken at the parish's expense. The book (now in the Nottinghamshire Archives) also provides some insight into the construction and internal arrangement of the houses which apparently remained largely unchanged right up to the time of their demolition. Each cottage consisted of one room downstairs and a bedroom above, the latter being reached by means of a ladder passing through a trap-door in the ceiling of the living room. Water was obtained from a single well 7ft deep and even up to the time of demolition in 1945 there was never any piped water or sanitation (the latter was provided by a simple ditch which encircled the cottages on three sides). A description published in the 1940s noted that the materials used in building Lunnon were "such as could be got readily in the immediate vicinity, namely mud and straw. The walls were substantial, being 18 inches in thickness while the roofs had a thick covering of mud and thatch". In his book The Place Names of Nottinghamshire (1940), J. E. B. Gover considers Lunnon to be an ironical colloquialisation of London , where the poverty of the Nottinghamshire hamlet was contrasted with the bright lights and finery of the big city. It was a name which was applied to many poor house communities up and down the country and still today Lunnon may be found as a street name at Barton-in-Fabis and at a housing development in Wysall. The basic principles of the Elizabethan Poor Law remained in operation (subject to alterations and additions) until 1834 when the Poor Law Amendment Act completely overhauled the means by which poor relief was administered, paid for and received. Under the new Act the poor of Scarrington were sent to the Poor Law Union workhouse at Bingham, and as far as their original purpose was concerned the houses at Lunnon became obsolete. They were not, however, abandoned with the majority remaining occupied for the best part of another 100 years. The first round of demolitions at Little Lunnon took place in the early years of the 20th century when in 1914 the rural district council ordered seven of the cottages to be closed as they were unfit for human habitation. Fire is said to have accounted for the loss of at least one more, and by 1945 only two remained, uninhabited and derelict. As these final two cottages were demolished, all traces of this historic community vanished for good. "No one," commented a local newspaper at the time, "will regret the disappearance of the property for any practical reason, yet one family at least will be sorry for sentimental reasons. 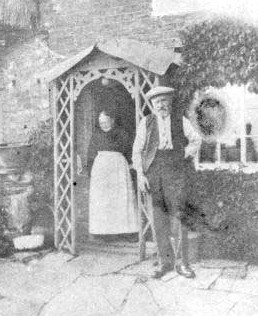 Mr and Mrs George Worley were the last couple to sleep in Little Lunnon and when they packed their bags and left they left a cottage which had been home to the Worleys for over 200 years." This page was added by Martin Ballance on 12/01/2014. You mention Little Lunnon's/London's also at Wysall and Barton-in-Fabis. Here's another for the list,: Torksey. In 1937 Adrian Oswald published an archaeological report titled "The Roman Pottery Kilns at Little London, Torksey..."